Home Builders in Ontario – Building Dreams One Home At The Time! Every single person out there has dreams of having a beautiful home. Honestly speaking, it’s natural for one to have such desires, and we at ICFHome.ca are here to make your wishes come true! Yes, you heard that right! The team of professional home builders in Ontario at ICFHome.ca is here to make all your wishes and dreams of having a beautiful home turn into a reality! Who are we? The most professional, skilled and experienced home builders in Ontario that you would ever come across! Seriously, these aren’t mere claims. Instead, when you get in touch with our team of professional builders, you would surely acknowledge the fact that we deal with our clients in the most professional, yet humble manner possible. Apart from that, we specialize in planning, designing and building custom home – that too using the famous ICF or Insulating Concrete Form technique! This is because we wish to make sure that every single client that we service gets to acquire a beautiful, energy efficient home that will offer all the comfort in the world! If you are on the lookout for home builders in Ontario that have the potential, and the skills required to construct custom homes of the finest quality, then you need to get in touch with us right now! To tell you the truth, the team of professionals at ICFHome.ca have 50+ years of experience to offer, and to supplement our services, we also make use of the latest building technologies and materials. It is for this reason that every single project that we work on turns out to be nothing short of being outstanding! The reason why we are so focused upon the utilization of the ICF technique is because it helps build homes that are stronger, and a whole lot more energy efficient. With the ICF homes that we build for you, you can save up substantially over energy bills. How is that possible? It sure is, because walls that are built using the ICF technology have tighter construction, with far better insulation properties. 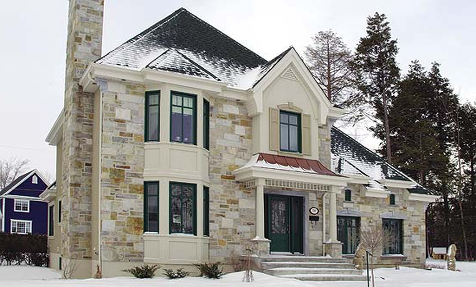 Not only do the ICF homes that the team of professionals at ICFHome.ca require less energy to heat, the same also holds true in terms of cooling as compared to wood-framed structures. This means that you and your family would be able to relax in utmost peace and quiet! The best part is that their greater thickness helps cut down or even eliminate all loud noises! This way you can rest-assured that the homes that we will build for you will be as comfortable as you want them to be! So, if you are interested in taking on the services of the home builders in Ontario to get your dream home built, then give us a call right now at 1-866-868-6606!